Loot Monkey: Bling Palace is 2D, flip-screen platformer that tests your wits and your patience, not your ability to mash buttons. Inspired by Jet Set Willy and Manic Miner, Loot Monkey: Bling Palace is more of a 'thinking person's platformer' where you'll need to consider your route through the many strange rooms of the loot-littered Bling Palace. You play as Dougie, the Loot Monkey, who has been instructed to collect his master's loot at The Bling Palace following a party. Featuring vibrant graphics Dougie must explore every room in the palace collecting all the twinkling loot just lying about. Dougie must also avoid the weird enemies and sharp hazards and lumps of vomit that the party has left behind, or else. 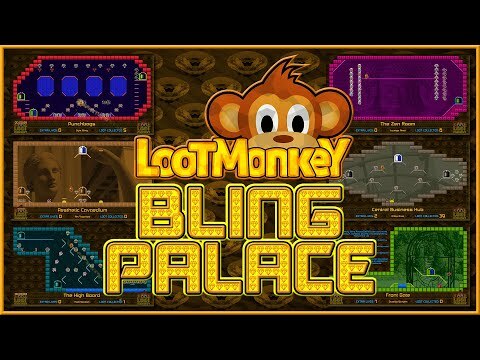 Loot Monkey: Bling Palace was released on Switch 256d ago in the US and the UK. Notify me when Loot Monkey: Bling Palace is available.